No kitchen drawer should go without a little power screwdriver. any of the four in our recent test will do. But even those tiny drills were pretty serious workhorses, and for around-the-house tasks like tightening a loose cabinet pull, they're more than you need. 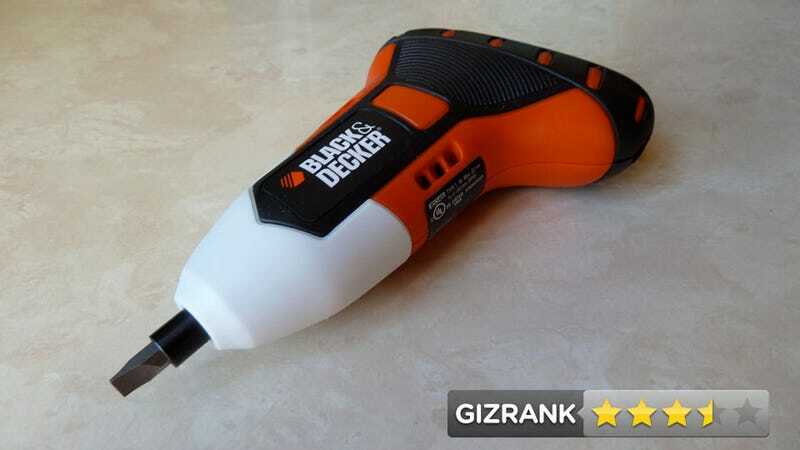 With Black & Decker's classic cordless screwdrivers, the problem was a lack of power, as anyone else who ever owned one knows. Yet, in recent years, batteries have changed. Power tools have evolved. And so here comes the Gyro, a new palm-sized driver with an attractive balance of weight, size, strength, and—thanks to a new gyroscopic sensor to control the bit's motion—dead simple ease of use. It could be what your kitchen drawer's been looking for all along. A palm-sized 4-volt cordless screwdriver with a gyroscopic sensor that detects a flick of the wrist, then sends the bit spinning. Anyone who lives in a house full of screws which occasionally need to be loosened or tightened. Totally unique. The gyroscopic sensor becomes intuitive once you get used to its behavior. After that, a forward/reverse switch just seems primitive. With the bit engaged in the screw head, a twist of the wrist in a counterclockwise direction starts a screw backing out, or vice versa. The heel of your hand depresses a big button, but your forefinger does not squeeze a trigger. The speed of the bit's RPM, from 1-180, reacts to the force with which you twist the tool. To stop it, you either twist in the opposite direction or take your hand off the button. Smooth, instantaneous transitions between forward and reverse make it as intuitive as a manual screwdriver—with a small drill/driver's power. Not heavy-duty at all. It's fine for tightening and loosening screws in ready-to-build furniture, door hinges, and drawer hardware. But with a relatively low max RPM and no way to grip a drill bit, it wouldn't be much use when assembling a small project using raw lumber. The specs claim the battery holds a charge "for 18 months." But there's no battery life indicator on the tool, and you can't tell when it's reached a full charge while plugged in. Guess you just have to... look at the calendar? Tested the tool by tightening up some wiggly drawer pulls—a pet peeve—and by socking down some screws that had slipped a little in a door's hinge plate. Also loosened and retightened some correctly installed screws to check its strength at freeing a sticky fastener. The LED light shines just above where the bit tip makes contact, but it never directly illuminates the work. Very comfortable grip—makes either a manual screwdriver handle or a drill/driver's pistol grip seem a little awkward. You can easily let off the gyroscopic sensor to finish tightening a screw by hand, if you prefer to feel the screw's resistance to make sure it isn't overtightened and that the head doesn't strip. If you have a weak old Black & Decker stick driver on that wall mount in your kitchen—and you still use it even though it's underpowered and quick to die—this is the upgrade you've been waiting for. The Gyro isn't going to be seen in the hands of many contractors on construction sites. But if you know someone who wants to pick up a power tool for the first time, this is a fine place to start.